If you use Mac OS X Mail, it is good practice to rebuild your e-Mail mailboxes every few months. If you have more than 3 mailboxes added to Mac Mail, you should always rebuild your mailboxes every month. 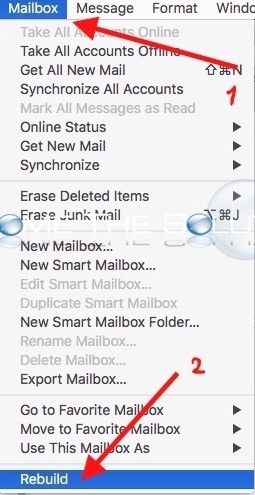 Rebuilding your Mac mailboxes is good practice if you receive a lot of e-mail on a daily basis, archive a lot of e-mail messages, notice slow email performance, problems searching Mail, or if you open e-mail messages and they are blank. In this guide, we we will rebuild several Mac mailboxes and re-index all e-mail messages. 1. Open Mac X Mail. 2. Empty out the following e-mail folders before rebuilding your Index. Delete all messages in Junk, Deleted Items, and if possible Sent Items. This will help speed up the index rebuild considerably. 3. Go to Mailbox -> Rebuild. The rebuild immediately begins. You will notice this process doesn’t let you know it started. You may also notice your current Inbox messages disappear, but don’t worry – they are there. 4. Wait about a minute then confirm rebuild is complete. Click around your mailboxes and you should start to see your e-mail messages again. 5. Quit Mail. Then, re-open Mail and confirm everything looks OK. Rebuild is complete! You should at least notice improved speed if you haven’t rebuilt your mailboxes in a while.